It’s airtight, but releases with a tap on the centered round button (which when sealed lays flush, the above photo is of an unsealed container). Reverse the process to seal. 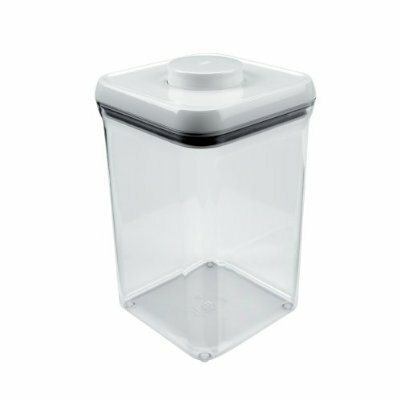 I had some smaller Michael Graves designed containers from Target, but OXO has the edge for being square (more volume in less space) and a seal/unseal mechanism that opens up for easy cleaning. The Target containers are great until you wash the lid and water gets stuck inside. 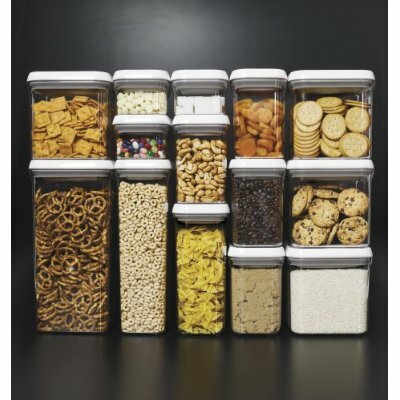 The OXO’s are also designed to play nice with each other, having dimensions that stack evenly. It’s also nice that you can have the lid in place and not have it sealed (which you can’t do with the Graves design). I have one on my counter now (AP flour), two more on their way (bread flour, white sugar) and I wouldn’t be surprised if I order a couple more as I find uses for them (brown sugar? legumes? cookies?). Little bits of happy. The top of my plastic, square container. Button, in the middle is stuck down….